The last decade has seen an increase in the successful application and use of external fixators. More complex procedures involving the ankle and leg require Ilizarov circular or ring fixators for stability and strength. Procedures involving the forefoot and rearfoot (excluding the ankle) do very well with the application of MiniRail fixators. The use of Unilateral MiniRail External Fixation System has grown in popularity over the last decade and has seen a high degree of success. From 2009 to 2011 and application of 29 MiniRail External Fixators were placed on 26 patients ranging in age from 23 to 79. A total of 9 different procedures were performed on the population with 15 different diagnoses. Mini-Rail External Fixators have also been found to be successful in the presence of comorbidities such as in patients with diabetes mellitus, smokers, osteomyelitis and avascular necrosis and have been shown to be definitive in cases where internal fixation has failed. All patients went on to full recovery with no complications or recurrences. Unilateral MiniRail External Fixation System is a device used in the treatment of bone conditions and deformities of the foot. In the last decade this application has evolved and become more popular with the development of systems that allow a greater understanding of this technique. 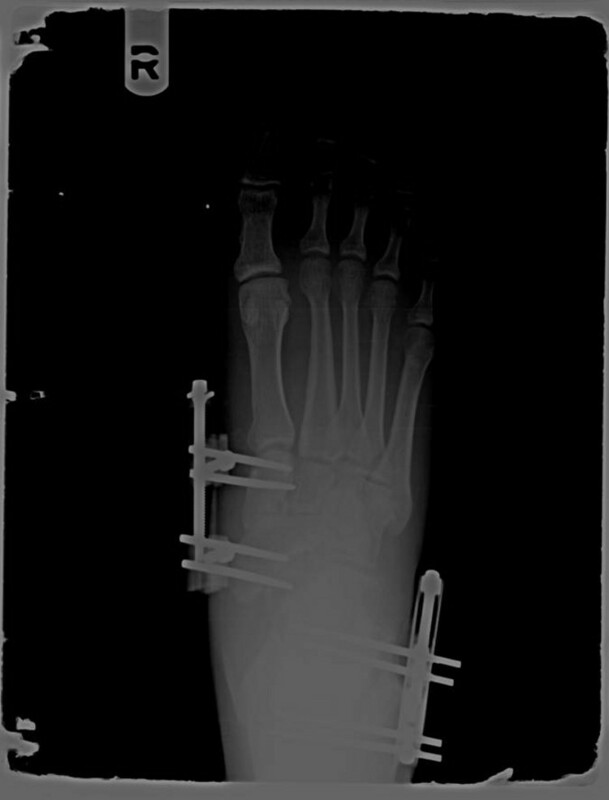 External fixation is divided into two main categories: circular frames and unilateral rails;[1,2] however the use of Ilizarov-type circular frames is reserved for more complex deformities in the foot and ankle as well as the distal leg. MiniRail external fixators have been described in the use of a variety of procedures, more commonly used in forefoot surgery. 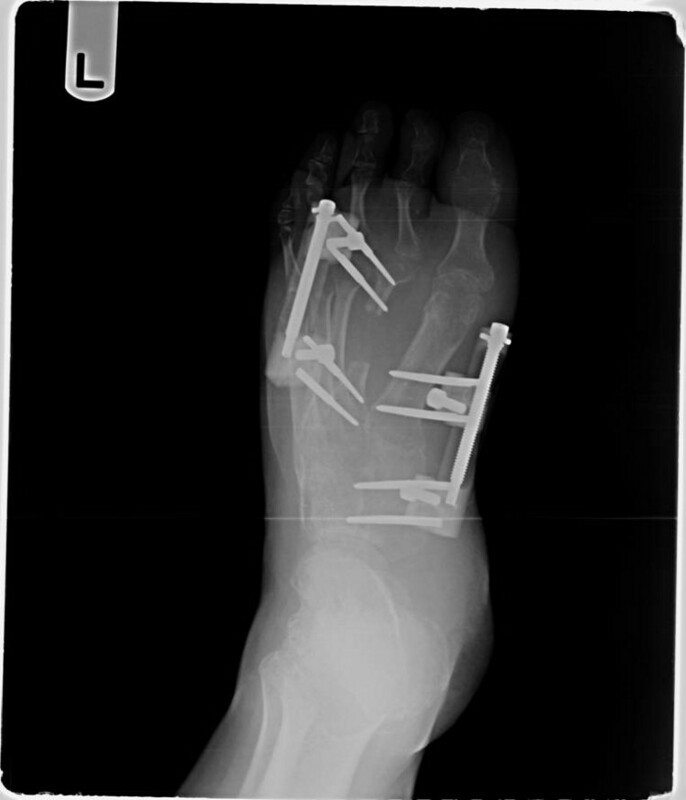 [1,3,4] In this paper we put together a total of nine different surgical procedures used to treat fifteen different foot conditions and deformities as well as trauma. All conditions were treated with unilateral external fixation system with excellent results. 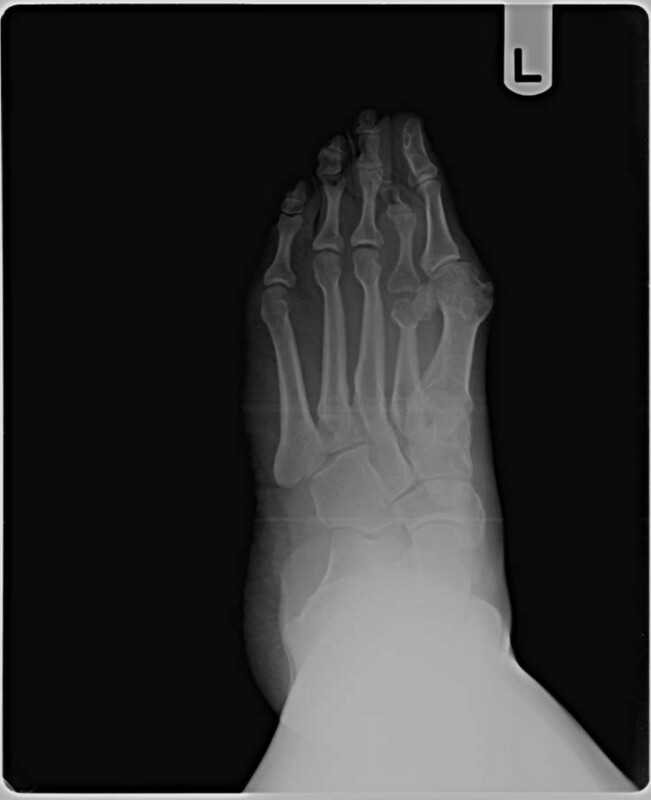 These procedures include arthrodesis of the first metatarsal cuneiform joint (with two revisions of this procedure not previously using a MiniRail), medial column fusion, open and closed reduction of Lisfranc fracture-dislocation injuries, metatarsal callus distraction, correction of first and fifth metatarsal fractures, sliding calcaneal osteotomy, first metatarsal cuneiform fusion and first metatarsal phalangeal joint fusion. As with any external fixation system, early weight bearing is not only allowable but encouraged as this expedites bone healing. Immediate motion of the proximal and distal joints is also allowed aiding in the reduction of edema and preventing capsular fibrosis, joint stiffening, muscle atrophy and osteoporosis. When it comes to multi-planar deformities, external fixators provide neutralization and stabilization with adjustable amounts of compression or distraction. This allows correction (compression or distraction) throughout the post-operative period through a minimally invasive procedure and a multifunctional correction. 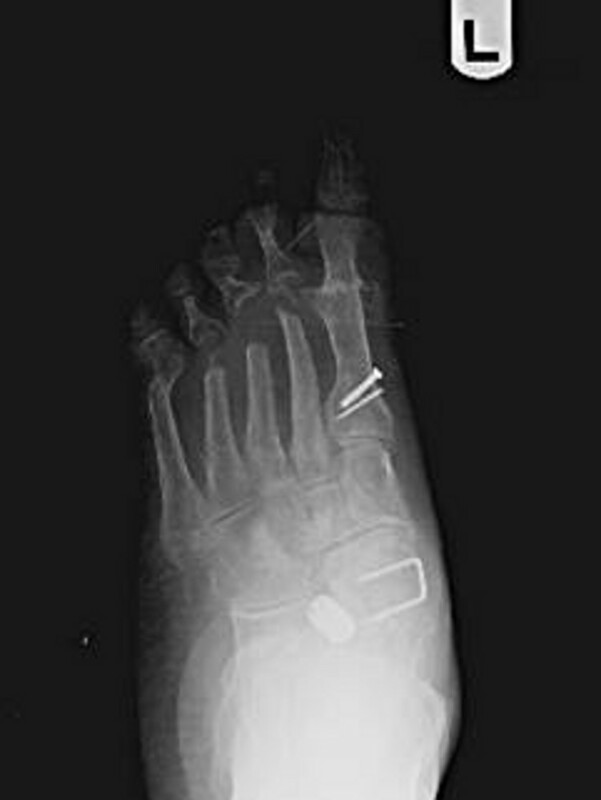 [1,2] Finally, once the desired correction has been achieved, the pins are removed and the patient is left with no internal hardware that may cause pain in the future. Disadvantages of the unilateral MiniRail system are mainly due to the complexity of the system and difficulty in application and manipulation. This difficulty can be overcome, as with any technical and mechanical difficulty, through surgeon education, training and experience. Another disadvantage of external fixator systems is the cost of the equipment, including the tools needed for application and removal. Although major incisions are avoided as well as placement of internal hardware, the risk of pin track infection and possible neurovascular damage continue to be a realistic risk. [1-3] As stated earlier however, most of these problems can be solved by early detection, quick action and by surgeon education and experience. A total of 29 Orthofix MiniRail external fixators were placed on 26 patients with 15 different diagnoses who underwent 9 different surgical procedures. The patients ranged in age from 23 to 79 years with 8 male (30%) and 18 female (70%) patients. Each patient was educated at length about both internal and external fixation. All advantages and disadvantages including complications as well as recovery time and weight bearing status after surgery were discussed with the patients in detail. All patients who opted for the MiniRail external fixator received pre-operative and post-operative instructions for careful management of the MiniRail. All patients received prophylactic intravenous antibiotic therapy 30 minutes pre-operative and post-operative weekly pin care (cleansing and dressing changes). In the study, compression-stabilization techniques were used in 26 out of the 29 procedures, within these cases 20 were Arthrodesis and 5 were fracture management techniques. One sliding osteotomy with fixation and 3 distraction- stabilization procedures were also performed (Table 1). All patients had weekly post-operative adjustments of the mini-rail except for the callus distraction patient who performed his own adjustments daily. Intra-operative x-rays were performed to confirm position and stabilization with follow-up x-rays performed at 3 weeks and 8 weeks post-operative. The average post-operative period with the MiniRail was 8 weeks with weight bearing beginning as early as one week post-operative with the aid of a surgical shoe and crutches. 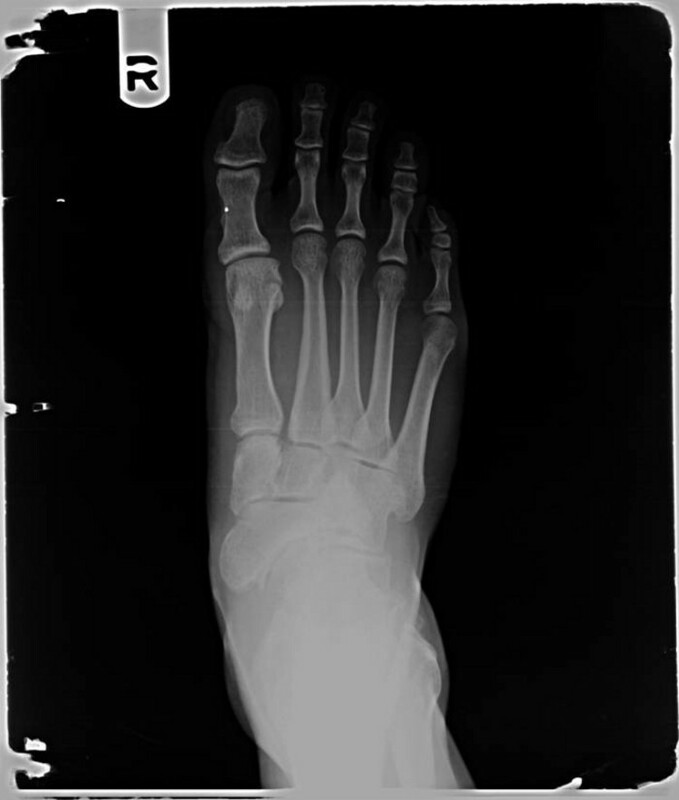 Ten Lapidus fusions were performed with 4 pins placed perpendicular to the long axis of the bone: 2 in the medial cuneiform and 2 in the shaft of the first metatarsal. 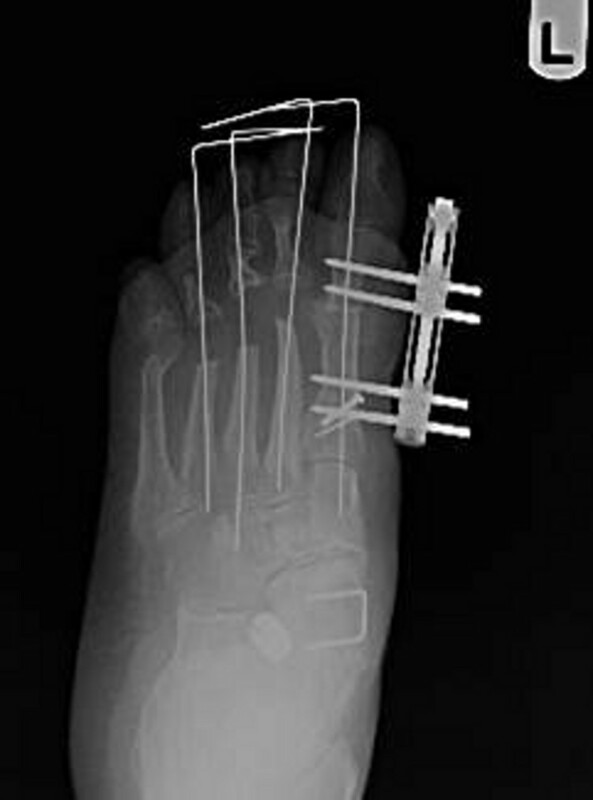 Prior to pin insertion, the first metatarsal cuneiform joint was prepared under fluoroscopy with temporary fixation through the use of 0.45 Kirschner wire. After placement of the MiniRail, compression was then achieved with an Allen wrench. Figure 1 Examples pre-operative evaluation of 1st and 2nd metatarsophalangeal joint (MPJ) with varus deformity (A and B). First MPJ fusion with MiniRail (C and D). 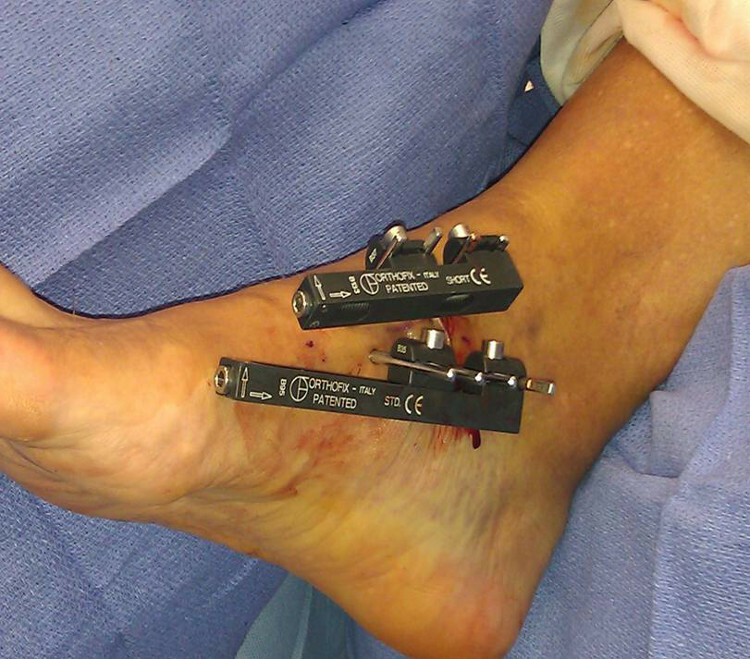 Post-operative evaluation after 1st MPJ fusion and external fixator removal (E and F). Two revisional Lapidus fusions were performed after failed procedures with internal fixation resulted in non-union. The screws were removed and the joint was prepared once again for the Lapidus procedure described above. 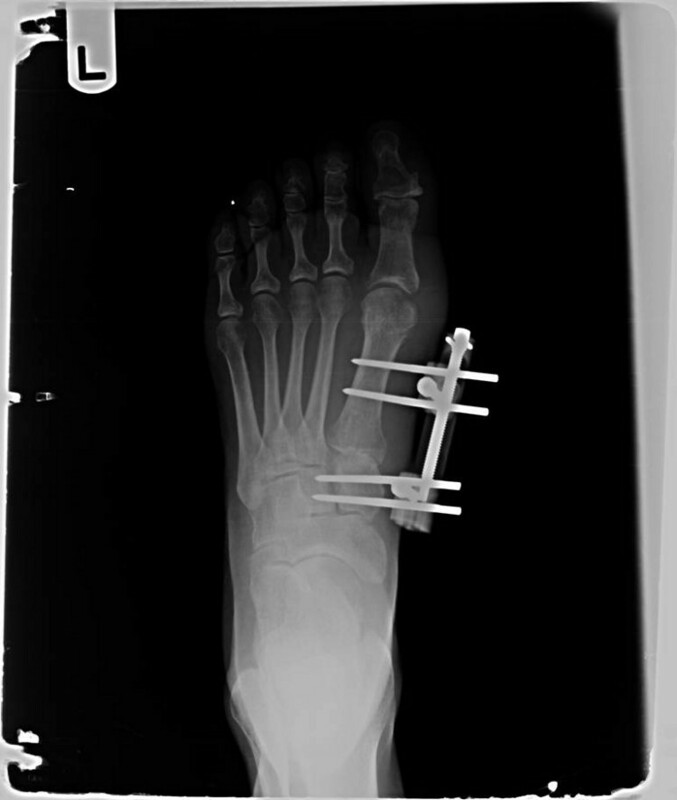 Three medial column fusions were performed with a talo-navicular joint fusion involving the use of 2 pins in each bone and compression through the rail with early weight bearing after 1 week and post-operative adjustments made every other week. 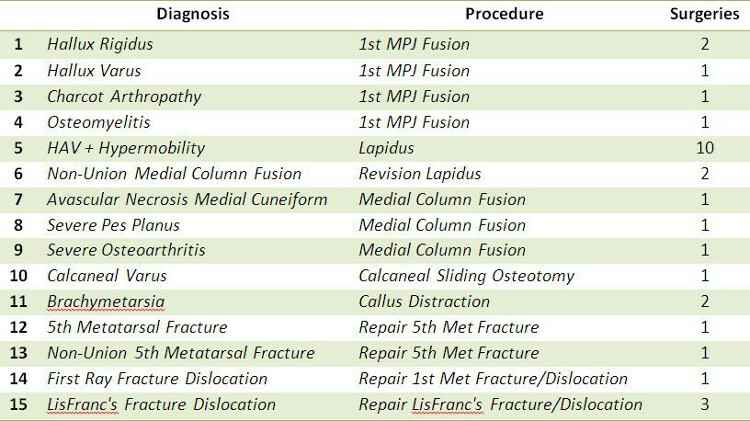 Table 1 Summary of diagnoses and procedures performed. 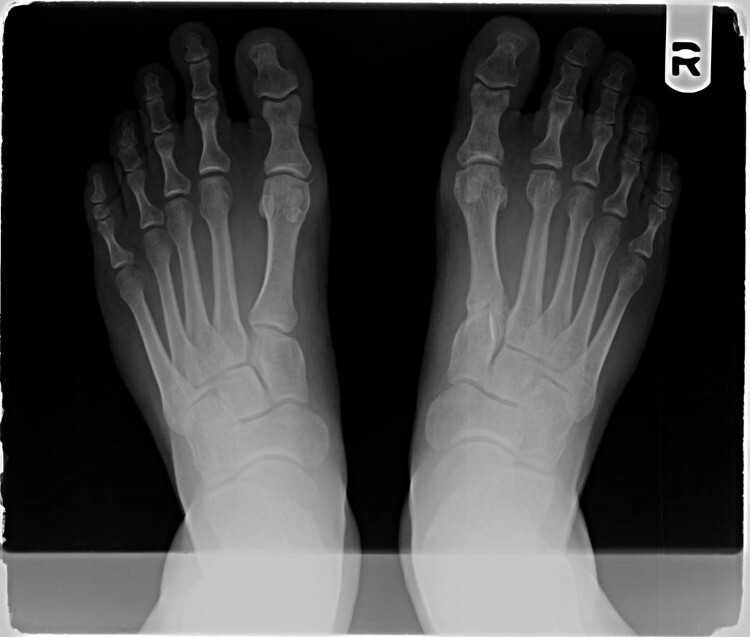 Figure 2 Example pre-operative (A) and Post-operative (B) radiograph evaluation of metatarsal cuneiform fusion and brachymetatarsia deformity. 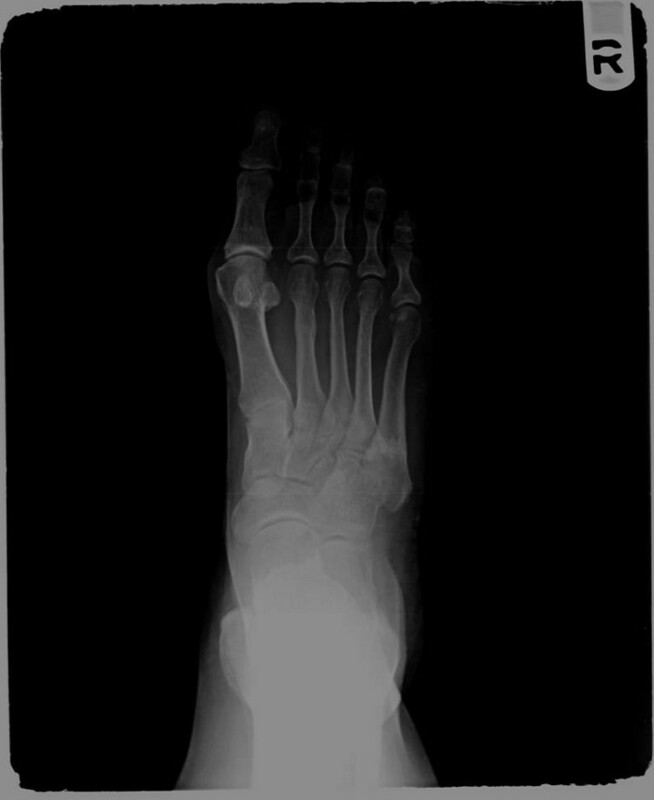 Figure 3 Example metatarsal cuneiform joint fusion. 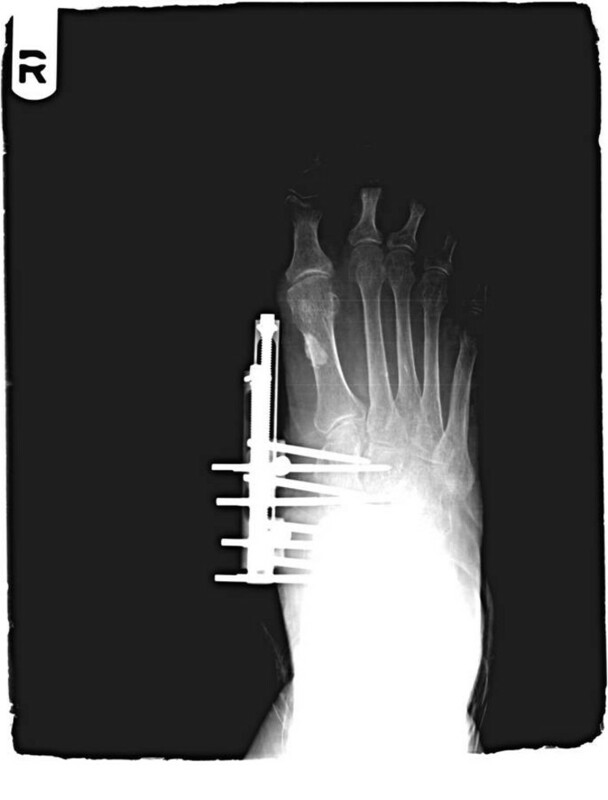 Three Lisfranc’s fracture-dislocations, two fifth metatarsal fractures and one first metatarsal fracture-dislocation were reduced with a total of 6 MiniRails with compression through fracture defect. 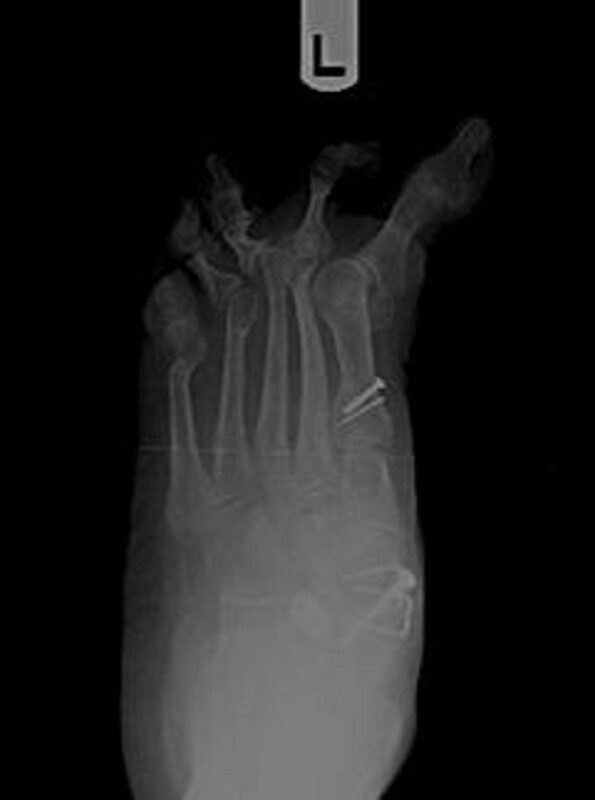 Five first metatarsal-phalangeal joint fusions were performed with 4 pin compression at the joint through the neck of the first of the metatarsal and the first proximal phalanx. 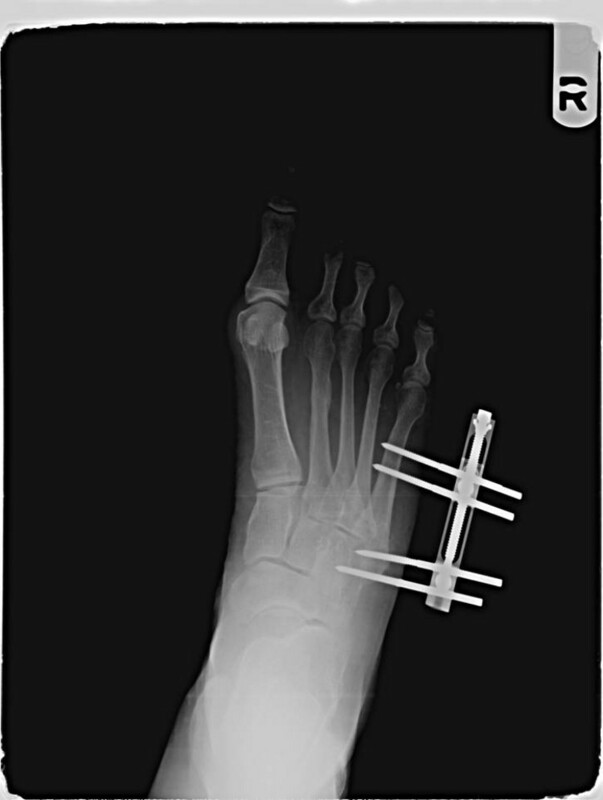 Two Brachymetatarsia callus distraction procedures were performed with MiniRail placement along the metatarsal shaft. Daily adjustments of the MiniRail were performed for callus distraction by the patient at home. 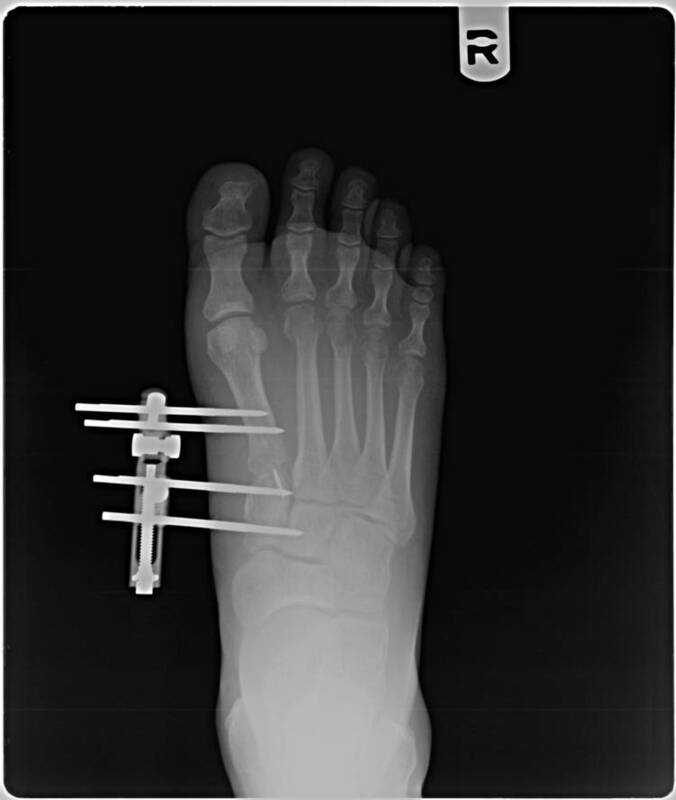 One sliding Calcaneal osteotomy procedure was performed and a MiniRail external fixator was used for compression and stabilization of the osteotomy. 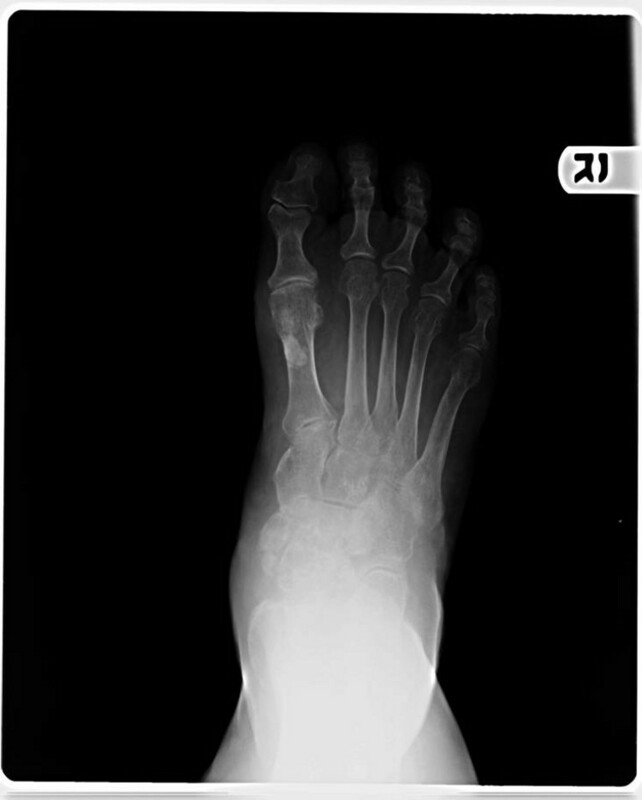 Figure 4 Example midfoot osteoarthritis. 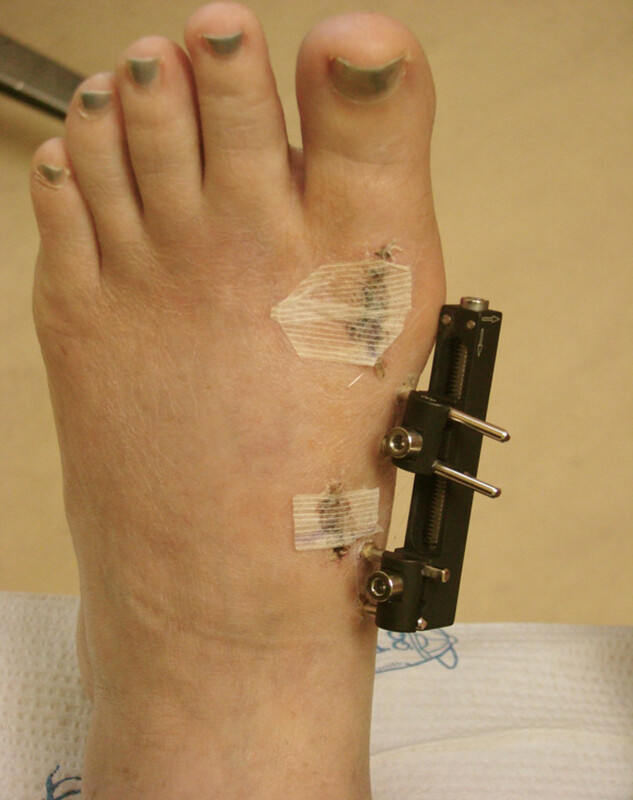 Figure 5 Example brachymetatarsia with MiniRail external fixator and k-wire fixation. Of the 29 procedures, all patients went on to full recovery with no complications or recurrence. The average time of duration with MiniRail external fixator was 8 weeks with removal at that time +/- one week. 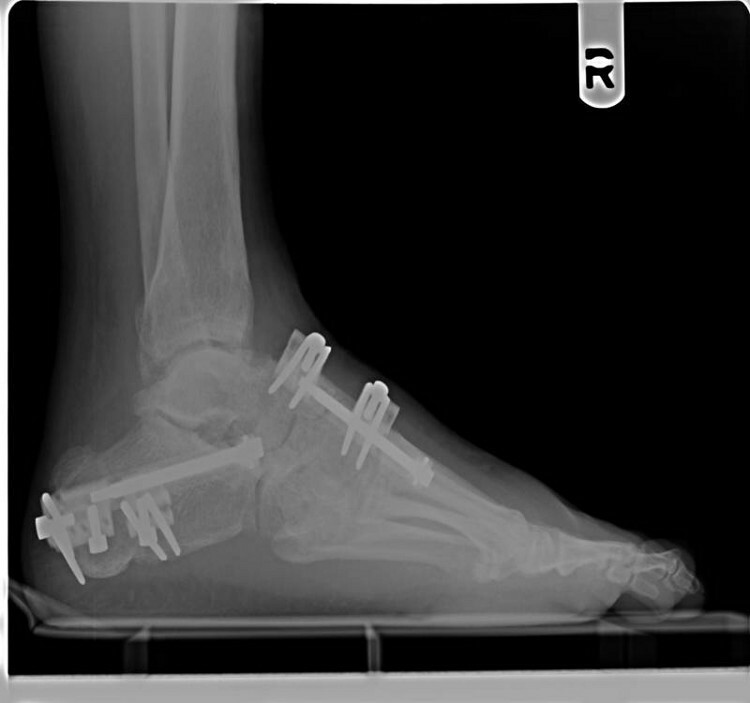 After removal of the MiniRail external fixator, all patients had an average recovery period of approximately 3 weeks at which time patients were allowed to transition out of their post-operative shoes and into athletic shoes. By one month following removal patients were cleared to return to all normal pre-operative activity without restrictions. Physical therapy was highly recommended to all patients to regain muscle strength and balance and averaged 3 weekly physical therapy sessions for 3 weeks. 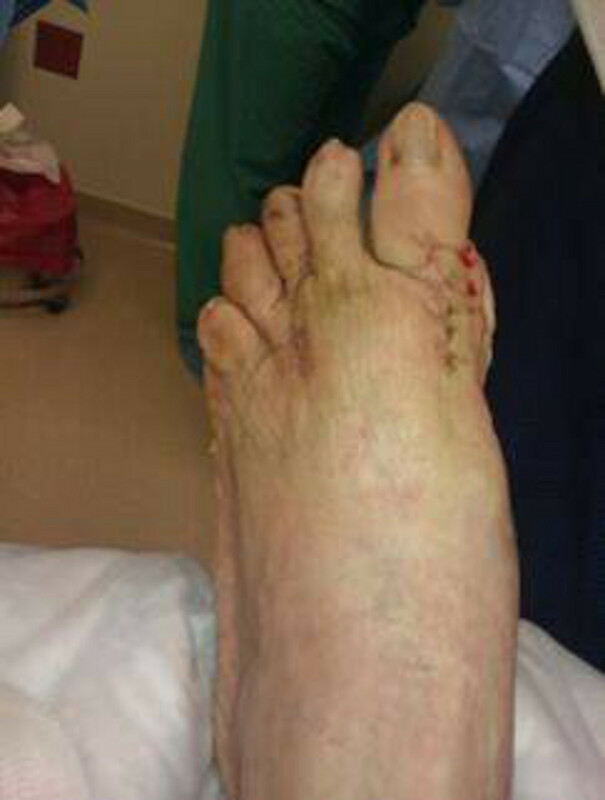 Most patients were allowed to begin physical therapy a week after removal of the external fixator. To date there have no recurrences and patient satisfaction has been overall positive with results. There was no need for further corrective procedures and all patients went on to full recovery. The use of external fixation devices has been in practice for many years. Today the use of external fixators has become a popular methodology for treating a great variety of conditions with minimally invasive procedures. 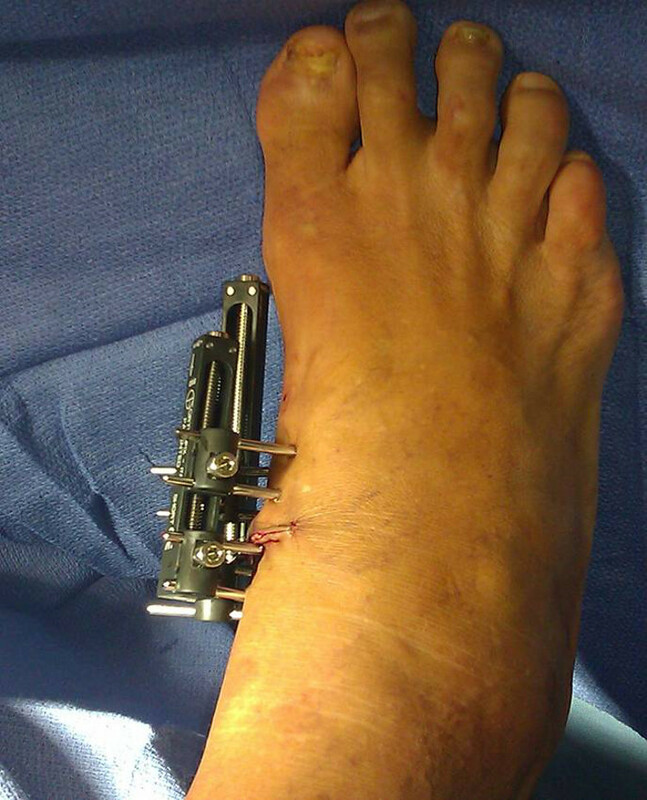 While the larger ring fixators are reserved for more complex conditions (ankle fractures, limb lengthening, Charcot reconstructions), MiniRail external fixators have been a staple for the minimally invasive surgical correction of various forefoot and midfoot conditions as well as some Calcaneal and rear foot conditions. 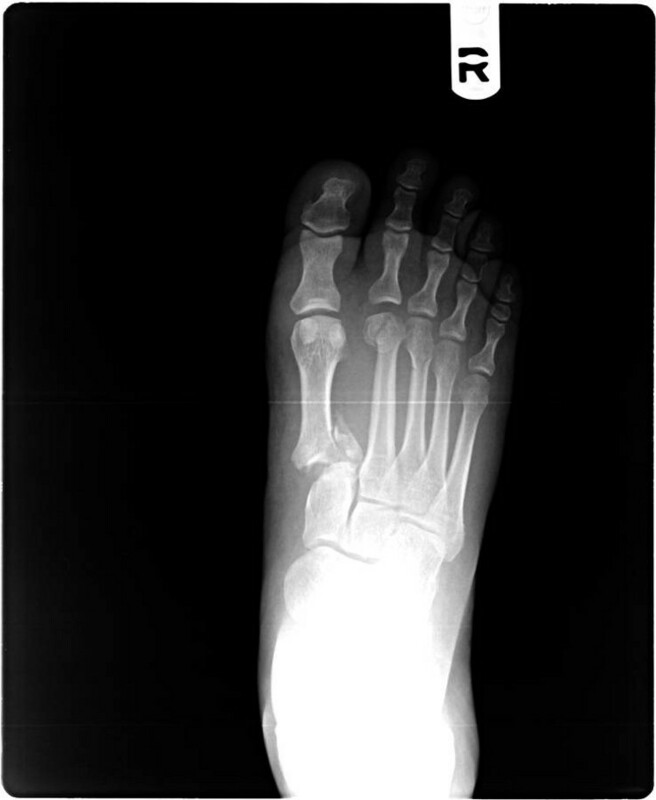 Figure 6 Example Lisfranc fracture dislocation pre-operative (A) and post-operative (B), and follow-up evaluation (C). 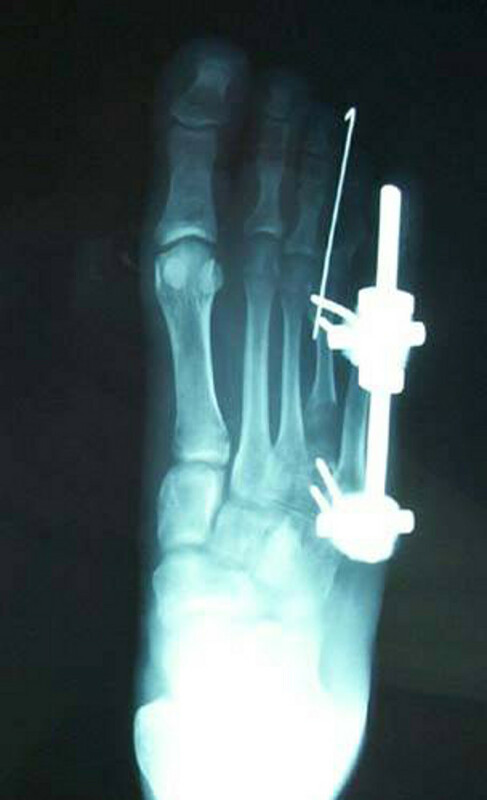 Figure 7 Example fifth metatarsal fracture non-union repair using MiniRail. Figure 8 Example Tarsal coalition fixed with MiniRail. In this study, 26 patients underwent a total of 9 different surgical procedures with application of 29 MiniRail external fixators to correct conditions in 15 different diagnostic categories. All patients received pre-operative education and weekly post-operative adjustments and pin care with follow up x-rays at 3 and 8 weeks. The patient population ranged in age from 23-79 years of age with females outnumbering males 18 to 8 respectively. We will continue to use MiniRail external fixators for future cases and hope to broaden the scope of indication for the device. Although this study has a very small sample population, the degree of success we have experienced thus far will propel us forward to continue. 1. LaBianco GL, Vito GR, Rush SM. External fixation. In: Banks AS, Downey MS, Martin DE, Miller SJ, (editors). McGlamry’s Comprehensive Textbook of Foot and Ankle Surgery. Vol 1. 3rd edition. Philadelphia: Lippincott, Williams & Wilkins; 2001. p. 107–38. 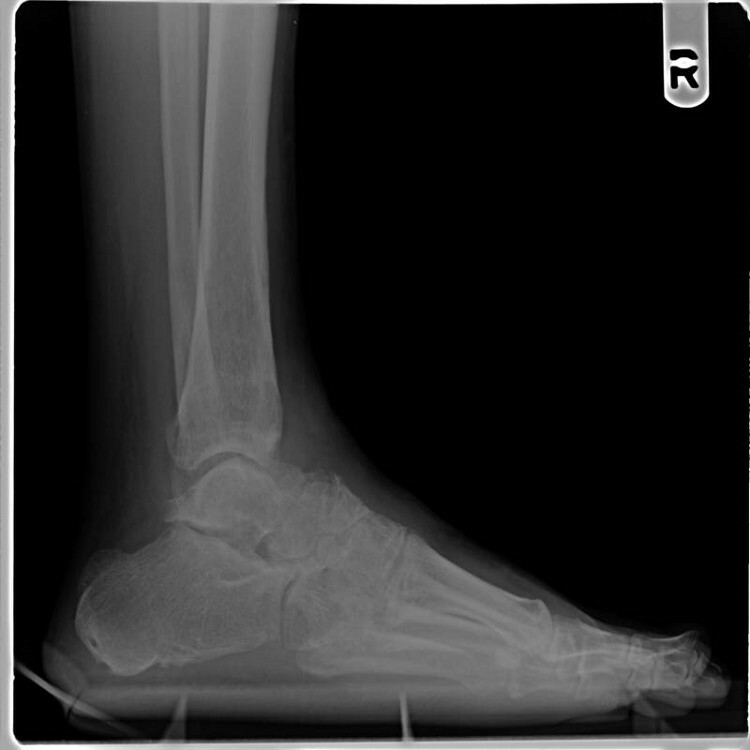 This entry was posted in Uncategorized and tagged Charcot arthropathy, external fixator, MiniRail, nonunion, Osteomyelitis, Uncategorized. Bookmark the permalink.